These are the transcripts of an interview with Mobb Deep on DJ Hyphen & J. Moore's "Sunday Night Sound Session" on Seattle's KUBE 93.3 FM. For more info. on DJ Hyphen click here. MVRemix: This is your seventh album, but the first with G-Unit. So what did you guys want to do with this one artistically? Havoc: I mean basically, we wanted to achieve the same things that we've been achieving over the years. 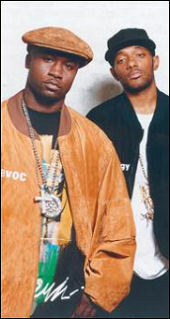 We didn't wanna change our sound or nothin' like that, we always gonna be Mobb - Mobb Deep, straight up. MVRemix: And so 50 [Cent] is credited with being the executive producer of the album, how much involvement did he have? Is he kind of just helping you with the overall vibe of it or what? Prodigy: I mean yeah, basically. He would like send us beats, send us songs and we would send him stuff too. It was like we were working together, half and half. Havoc: I mean yeah, Noyd is still part of the family. But the cuts that we did do didn't make the album unfortunately. But the material that we don't use, we use eventually - we never let nothin' go to waste. So it's all good. MVRemix: That leads us onto the next question - you've got a lot of music that you've never released that you guys have recorded over the years. What's some of the stuff that you guys are going to be doing with that? Havoc: Right, you know what I'm sayin'? Like mixtapes, movie soundtracks. Anything we can make paper off of we doin' it. MVRemix: The current single is "Give It To Me" - are there any thoughts for the next single? Prodigy: We had a couple choices. We were thinkin' like the Mary [J. Blige] record and a couple others. Yeah, "Give It To Me," we just shot the video for that so that's on and poppin' right now. MVRemix: You guys should flip it up and have the video with the Mary joint with the "Tick, Tock" cut in the middle with the same sample - that's the joint. I want that to be the single! Havoc: We had to re-furbish that real fast, you know what I'm sayin'? Havoc: Yeah, yeah, we cool. That's why we out here workin'. You've got to get out there and walk your dogs. MVRemix: How has the road been so far? Havoc: The road's been good. Backstage passes and... a lot of backstage passing. MVRemix: How long are you gonna be on state side before you guys get overseas? Havoc: Actually we'll be overseas I'd say by - a month and a half we about to do Canada. We're about to wrap up this US tour and we'll go up to Canada in about a week or two. Prodigy: It's all good, they just not ready. They not used to hearing stuff like that - shocking stuff coming out young rappers mouths. So it was like, "Whatever man, we don't share the same view." The reason I wrote those lines is because we've been lied to all these years with religion and all that stuff - from my point of view. MVRemix: To be honest, I agree with the line. I'm not sure people were ready to hear it, it was so upfront. Prodigy: Somebody gotta step up and say it. MVRemix: Obviously you've been working on other G-Unit stuff. I was reading an interview with Lloyd Banks saying how in fact he might pick the single - it might be the joint with you guys apparently. But do you have any other plans with G-Unit people? Maybe an M.O.P./Mobb Deep collaboration? Havoc: You know, anything's possible. A lot of things be in there, so if it happens, it happens. MVRemix: Do you guys working with G-Unit for a long time? Havoc: I can't predict the futures, but I wouldn't mind workin' with anybody for a long time, of that stature. It's a good team over there. Everybody's happy, we work together like a family, so I definitely don't got no complaints. Havoc: It's a lot of great artists out there that'd we'd like to work with. Nyce: Yeah, yeah, yeah it's the kid Nyce, the future man. Infamous G-Unit for life! 40 Glocc: Yeah, it's California's finest. Big bad 4-0 a.k.a 40 Glocc! MVRemix: What's the information on that, you guys working on solo's each? Havoc: Right now we're working on our album altogether. Then we're gonna work on separate projects. So we're just gettin' ready for 'em. They on the road from us. MVRemix: Good people to learn from, you guys have got multiple albums under the belt. If you had to pick one - all the way back from the "Juvenile Hell" days all the way up to "Blood Money," which would be your favourite? Havoc: I would have to say "The Infamous," that'd be my pick. Prodigy: "The Infamous" got it poppin'. MVRemix: Is it tough to once you release a classic album... I think Andre from OutKast said, "My curse it to out do the last verse," how tough is it to follow up classic stuff like that? Havoc: Believe it or not, we don't even think about it. Every time we just went in there and did it, we didn't try to out do ourselves. I think if you try to outdo your last project, you might over-do it. So you've got to just go in there and do what you feel. MVRemix: You guys have been doing it for a minute. Has there ever been a step along the way where you guys just got bored and dis-interested in the music or the state of the music itself. And if so, how did you find the strength to get your passion back? Prodigy: We never got tired. We always in the studio hangin' out and doin' joints, know what I mean? Nothin' ever discouraged us. MVRemix: When you guys went in the studio back in the days when you guys were comin' up - was it ever a conscious effort to capture the QB sound - the QB vibe. Or did it just come out naturally that it came out so grimy? Havoc: It just came out naturally 'cause that's where was from. You know what I'm sayin'? It was part of our environment and the mood, it was in the air. It wasn't nothin' to work on. MVRemix: Do you think "Blood Money" captures the current vibe? Prodigy: To me, yeah, definitely. There's a lot of songs on the album that just put you in that Mobb mood for sure. MVRemix: On the music side of things who are you guys checkin' for? Besides Alicia Keys. Havoc: Who you got P? Prodigy: I count on one finger all the rappers that excite me. [Everyone chuckles] We listen to a lot of mixtapes. MVRemix: He's kind of killin' it right now. I think he's got tapes lined up for Michael Jackson, Eminem... It doesn't get any bigger than having a tape comin' out with Michael Jackson. MVRemix: What's next for y'all, what's the next step? Havoc: Movies. More albums. You know! Prodigy: Production. Writing songs for other people - ghost writin'.